Democrats find a weapon in the Senate tax bill. The Republican push for tax reform just got complicated. 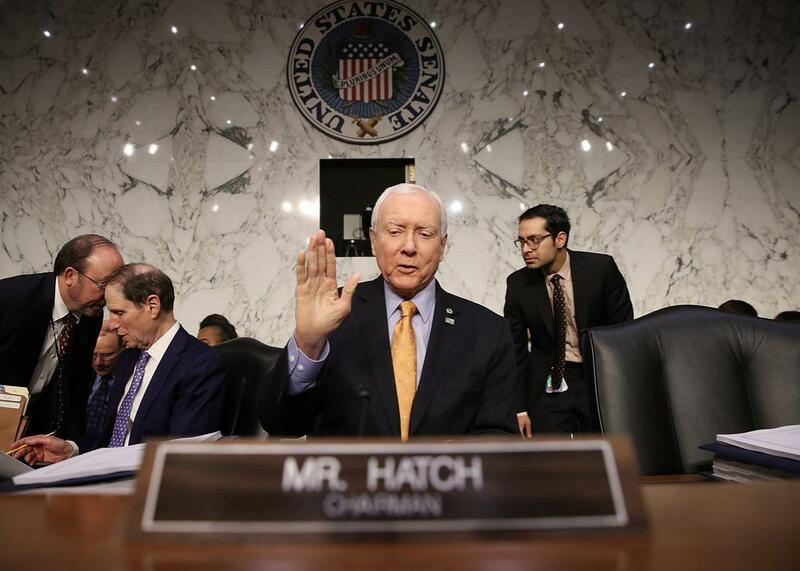 Senate Finance Committee chairman Orrin Hatch gestures before the start of a markup session on Wednesday. A tax reform process that had been moving with relative ease through Congress got much knottier on Wednesday, as complicated bills tend to do when the flashy debuts have receded and the thorny details begin to emerge. For Senate Republicans that meant defending two tough propositions: the sudden inclusion of a provision to eliminate the individual mandate for health care, and the decision to sunset tax cuts for middle-class families, while allowing corporations to keep them in perpetuity. The new provisions made for a chippy morning in the Senate Finance Committee. Oregon Sen. Ron Wyden, the committee’s ranking member, seemed excited to weaponize the changes that were formally introduced by committee chairman Orrin Hatch of Utah the previous night. “This bill seems to get worse by the hour,” Wyden said. He noted how during Tuesday’s Senate Republican lunch—“sometime between the salad course and the entree”—the conference decided to toss a repeal of Obamacare’s individual mandate into the tax bill. This would “kick 13 million Americans off their health care and [raise] premiums for millions more.” Democrats have been scrounging for something to whip up activism against the tax proposal and now hope that the sudden insertion of health care politics will help them re-create their summertime defense of Obamacare. “This is not a garden variety attack on the Affordable Care Act,” Wyden said. “This is repeal of that law!” Wyden kept asking the in-house tax expert at the witness table to discuss the mandate repeal’s effect on coverage, and Hatch—not for the final time in the morning session—got pissed. “Let me be in control of this committee, not you,” Hatch said, cutting Wyden off. Florida Sen. Bill Nelson told Hatch that cutting off such questioning was unbecoming of such a “gentleman.” Accusing a colleague of behavior unbecoming of a gentleman is about the gravest charge a senator can make. The inclusion of the mandate repeal, along with the sunsets, scrambled the politics surrounding tax reform. It gave Democrats two new talking points to rally their opposition around: that the tax bill is a backdoor Obamacare repeal and that it makes individual tax cuts temporary in order to pay for permanent corporate tax cuts. Each change will complicate the final bill’s chances of passage by awakening certain sensitivities in the whip count. Though repealing the mandate goes a long way towards securing the votes of conservatives like Arkansas Sen. Tom Cotton, Texas Sen. Ted Cruz, and Kentucky Sen. Rand Paul, it moves at least one critical moderate vote, Maine Sen. Susan Collins, closer to opposition. The mandate is one of the big mistakes. Including the mandate sends a “very mixed message” about the purpose of the bill, Collins told CNN. She also cited some “new statistics” she had that “that show that for some middle-income people, it will cancel out their tax cut” through increased premiums. It’s still hazy how including the mandate repeal in a final bill negotiated between the House and Senate would affect the House’s whip count. But there’s one telling sign that it wouldn’t help: A mandate isn’t in the House bill that members are voting on Thursday. Moderate Pennsylvania Rep. Charlie Dent—who was getting the full squeeze during a Wednesday afternoon House vote, with Majority Whip Steve Scalise and Chief Deputy Whip Patrick McHenry sitting on either side of him—said that it would be a “mistake” to repeal the mandate in the final bill. “It makes the tax bill harder, not easier,” he said. About an hour into the session, though, Maryland Sen. Ben Cardin, a Democrat, turned attention to the sunsetted individual cuts. As I wrote last week, this was the decision facing Senate Republicans, whose initial bill would have egregiously violated the “Byrd Rule” governing what is and isn’t allowed in fast-track reconciliation bills. Hatch finally dropped it last night. It is, of course, terrible optics to make individual tax cuts temporary in order to pay for a permanent corporate cut. Democrats intend to exploit that. GOP tax plan making individual breaks temporary revealed 10:30 p.m. Tuesday. Republicans’ most honest explanation for sunsetting those cuts is that they’re merely a massive budget gimmick. They argue that there’s no way a future Congress would allow the cuts to expire. Such gimmicks, then, mask the true cost of the bill, which creates a problem with some of the budget hawks in the Republican caucus. Other individual pet peeves will emerge in the final push. Wisconsin Sen. Ron Johnson, for example, told the Wall Street Journal on Wednesday that he was a “no” on the bill, arguing it prioritizes large corporations over small businesses. It’s probably better to view this, especially in Johnson’s case, as a plea for attention to his concerns rather than a final decision. But he won’t be the last to make such a plea. Tax reform is a minefield. Leaders are finding the mines.